while i'm not new to tuning cars, i look forward to trying new ideas with this one. There are some great people around me to help with the hard stuff, but i think here is the best place to learn more model specific details-. From guys and gals who are more knowledgable about these awesome little cars. Re: Hi there, i'm new. 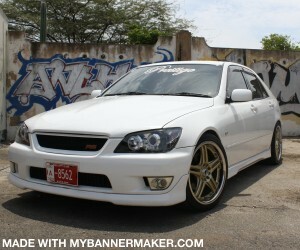 Gojira san wrote: I just got an Altezza. Really, thankyou all for the welcome. It's nice to see there's a great community on here. My car is still at the dealers shop in Kobe. i will wait for shipping/ and shaken. then it will arrive at my secret lair in the Japanese mountains. here are the pics that i saw when choosing to buy it below. it's a RS200 Z with many factory options, including grille, side skirts, and a sunroof. it's AT, but i have no plans to change it to manual right now. i want it to be a daily "stuck in traffic" cruiser, with up rated handling, and a bit more punch than it has now. plans are to turbo it, 300+hp will get it up to speed. i already have a turbo, but will get a Greddy kit in the future, to put it together. waiting in my garage is a set of Gramlights "accelerate" rims in black/silver. and plenty of tires. Gojira san wrote: Really, thankyou all for the welcome. Honestly, as a car guy? I appreciate that when it arrives, I will start a build thread. because i already have boxes of stuff to put in it. and sharing the experience of building this car is what it's about. right? so between you(all of you), and me. many beers, and some of the most talented people i've ever met. this is going to be fun. welcome.. waiting for your project, kinda interested with turboing the AT, since my car is AT too.. hope to hear from you soon.. I got a build thread, the JDM daily driver thread. things are slow for this week, it will pick up soon.